In the active field of Science and Religion, is it necessary to reply to an essay that has not been published in a scholarly review? I responded positively to that question concerning “Faith and Reason: The Re-Emergence of Neo-Mu’tazilite Thought” by Abdelhaq Hamza because of the many polemical statements in it which stand in need to be contextualized if not counterbalanced. The fact that the preprint has appeared in various forms in several media including a lengthy summary in the SERRC  is another argument for writing the present reply. Hamza, a physicist at University of New Brunswick in Canada, has presented in that essay dealing with the issue of faith and reason, a sweeping critique to views on the subject held by some fellow Muslim scientists. Is his severe judgment that their views represent a deviation of the Islamic mainstream views on the subject or even that they have compromised the basic tenets of Islam warranted? This is what I will attempt to deal with as clearly as possible. Hamza’s essay contains repeated tirades against colleagues of Muslim stock that he accuses of having strayed away from conventional Islam, of having “cut and past their arguments” from Christians, and that they “ rub with the Christian ointment”. He mentions in particular N. Guessoum, and Z. Sardar, but also U. Hassan, P. Hoodboy, S. Hameed, R. Dadjani, and the present author. Then in what is meant to be a derogatory statement, he describes them as “Neo-Mutazilates”. But there are several problems with this characterization that are worth pointing out. First, lumping together people representing a whole spectrum of views and persuasions, from the devoutly Muslim to the acknowledged agnostic or even atheist is faulty methodologically wise to say the least. Then the author does not tell us what is wrong with holding M’utazilite views—M’utazilism being one of the historical schools of thought in Islam which was adopted all over the Muslim world for several centuries, although I believe none of the people quoted above adheres to it in any way. Also in what way do the views expounded by some of the above people on the nature of the miracles and other issues like biological evolution are considered to be Neo Mu’tazilism is never expounded clearly. His charge that all these writers are “neo-modernists in the field of Islam and Modern Science” is flimsy if not ludicrous. Furthermore, there is in Muslim circles, even among Sufi-minded ones, a regain of interest in Mu’tazilate thought in relation to the quantum physics as a philosophical closeness at the microscopic level has been noted by those people between both subjects. We mention among others Mohammad Altaei, Bruno Guiderdoni, Karim Meziane etc. Guessoum’s views on the Koranic story of Adam are bold but are not in my view beyond the Ijtihad (effort of interpretation) we expect from one whose stated purpose is precisely “Reconciling Islam and Science”. Now, similar attempts to do so from other religious traditions are bound to bear some closeness to his perspective but this doesn’t mean “following the Christians” as the charge Hamza is leveling against him and others. Hamza’s accusation may also be seen to be strange for the case of N. Guessoum—the main thrust of his attacks—who has written a whole book making a case for a Roshdian approach for the dialog between science and religion very much rooted in the Islamic high tradition albeit not of the Sufi or perennial brand. So his charge that Guessoum exemplifies those “who worship modern science” and take it as “their creed” is wholly unwarranted. Keeping science and religion wide apart like Hamza appears sometime to advocate—when he is not in a syncretism mood—make one obviously immune of any possible criticism of the sort. Let us tackle now the core of Hamza’s views concerning modern science. He starts his argument by claiming that “modern science is facing a deep crisis”. But he invokes examples mostly from modern particle physics, namely the Standard Model of particle physics purported shortcomings, the landscape problem in Superstrings theory, the difficulties facing the cosmic inflation theory in cosmology in the wake of BICEP2 data. Then he brings unexpectedly to the rescue the Muslim mystic F. Schuon and his views which actually bring nothing new to the subject. The thrust of what Schuon and others of mystical leaning have said, namely the existence of an extra realm of reality not accessible to our direct experiments but essential in the intelligibility of the Universe is something which would agree on it all the religious people and even many spiritually minded people not belonging to any religious tradition. He then goes on to claim that this “state of confusion” is no less than an indictment of the Western science as a whole, bogged down as it is in its epistemological trappings which ignore that extra natural realm. But this is quite over blowing the issue at hand and in serious need of some contextualization that we will now attempt to provide in the remaining discussion. He describes himself as an “active theoretical physicist”, which we might have conceded to him, although plasma physics is not usually thought to be theoretical physics, yet his various uses and abuses of “facts” that he collected here and there in buttressing his arguments show familiarity with the subject but certainly not a working knowledge of it. In any case, all what he ascribes to physics is speculative theoretical theorizing mostly from particle physicists which has been going on for decades and which can in no way be taken as the core of “modern physics”, even less as equivalent to modern science. Furthermore, the “crisis” in modern physics has been going on ever since the earlier 20th century or even earlier. One need just recall the headache that poses interpreting quantum mechanics from Bohrian (Copenhagen school) to Bohmian, to Everett’s one (Many- Worlds Interpretation) to other brands, and for which no consensus has emerged till now. Black Holes, although claimed to have been found indirectly observationally, is still a strange theoretical beast shrouded in deep mysteries, and physicists are still divided whether its existence will violates some fundamental laws of physics. Einstein’s theory of General Relativity has been widely acclaimed early on, then frown upon for several decades before seeing a rebirth in the seventies. Likewise for the Quantum Field Theory which is widely held to be the most accomplished physical theory and certainly the one providing the most accurate results of all the sciences, has been almost repudiated for a while before seeing a phenomenal flourishing in the late sixties in the wake of the quark model and the demise of the S-matrix and bootstrap theories. String theories and their Superstring extension have been criticized ever since they appeared in the seventies, and beside a number of theoretical physicists who came frontally against it as sterile and problematic in its total lack of contact with experiments, most of the others are aloof if not completely indifferent to this high-end hyper mediatized theory. The fact is that all those concepts and speculations could be proven wrong or irrelevant, while physics will still retain its coherency and basic integrity. Handpicking oral statements by authors like R.Penrose and N.Turok stating for the latter for example that the “theoretical physics is at the crossroads right now … we’ve entered a very deep crisis” to buttress his case is proving the contrary. How come a crisis in a pet theory for a subcategory of physicists, namely superstrings and its so many variants with its implications on multiverses, could be taken as an indictment against modern science and a proof of a deep epistemological and ontological crisis? Even theoretical physicist endowed with a super ego won’t go that far in leapfrogging. Those speculative ideas in theoretical physics and cosmology are indeed in constant flux and reflux on the scale of few decades and there is nothing wrong with that. The point is that one should not absolutize physical theories, but rather look at them as closer to elaborate metaphors rather well described within Holton theory of scientific progress where only a limited stock of basic principles or themata is made use of and get recycled. Don’t we say that science is not after absolute truths but only after relative ones that work—those that explain and have predictability? Holding to this view will go a long way towards defusing the tension with the metaphysical views one may hold and not essentialize science results. Having said that, it is clear that science results retain a great value in understanding the world and in fact there is no other way of understanding the material world in its intricate working. This vision can in no way be described as “worshipping science” like the author accuses us of doing. So physics is a robust discipline although with a moving frontier made of high-end speculations and this doesn’t stop it from being a paradigmatic science with none of the consequences stated by Hamza, namely that those perceived failings is turning modern science in a quandary. The conclusions he draws is that one need for science’s salvation that it be reconstructed on principles and values from the spiritual plane. We are of course not talking about the claim that “Science” is failing Mankind by lacking wisdom (thus Hiroshima, Bhopal, Tchernobyl …), which is something that scientists have mostly all readily acknowledged, and in particular the spiritually minded ones. 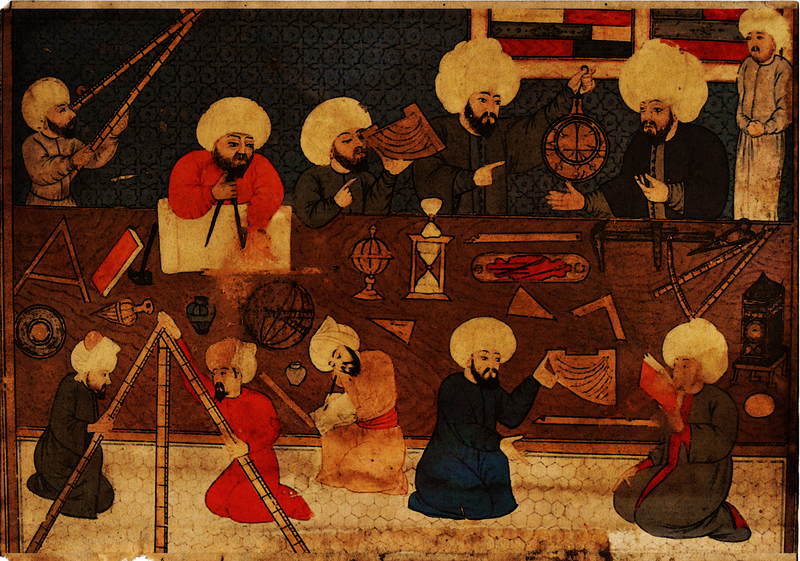 What is at stake rather is the naturalistic methodology which is at the core of the scientific enterprise and which is in large part the legacy of the great Muslims scientists of the past like al-Battani, Ibn al-Haytham, al-Djahiz etc. Hamza’s essay, despite its lengthy development with force quotations and his fondling for speculative theories that modern physics has been generating, falls in my view in the category of un-classifying work. Indeed, we don’t know at the end on what plane he is situating himself, phase transiting as it were in a fast and furious mode from science ground to the spiritual one without warning. Caught in this oscillatory mode, we are at loss to find what case he is trying to make. Thus, he could quite ably discuss the cosmic inflationary theory commenting on P. Steinhardt, and accepting the capability and legitimacy of physics to handle such questions linked to the very early universe in the framework of relativistic cosmology. He is also readily acknowledging in no uncertain term the falsificationist criteria which indeed stands at the core of science methodology, yet he would then make a sharp turn abruptly retreats into the cozy ethereal realm of mystical considerations whenever he feels uneasy with the science track. One may compare this attitude with that of S.H. Nasr, one master of spiritual Islam with a thorough mathematical training and of the same mystical Sufi persuasion as Hamza, who is repelling the actual science matrix altogether and calling for a new holistic epistemology with at its core the perennial philosophy of the Middle Age and before. It is without doubt a highly problematic epistemology, yet it has the virtue of clarity and coherence. So Hamza’s essay is inconclusive in his fiery claims about those Muslim authors he branded “Neo-Mu’tazilite” and “Neo-modernists”. His piece is in fact telling more about his views on modern science than the views of those authors that he severely misrepresent. The new “vision” he proposes- if there is one we can gather from his work—although definitively not of the “I’jazi” kind as our author seems to be conscious that the I’jazi paradigm is an unworthy track, nor of the perennial two-track one à la S.H.Nasr, is still highly problematic as it seems to mix up the two realms pleading forcefully that the spiritual one should guide and correct the other one even in its core precepts. As such it is, in my view, just brewing confusion with no guarantee to add anything useful to any of those two planes. Social Epistemology Review and Reply Collective: https://social-epistemology.com/2014/09/26/faith-and-reason-the-re-emergence-of-neo-mutazilite-thought-in-the-discourse-of-modern-muslim-scientists-abdelhaq-m-hamza/. His essay is actually replete with other disgraceful characterizations that I believe are unwanted in scientific writings. The book Islam and the Quest for Modern Science by Bigliardi shows the diversity of the points of views of some of the modern authors. Or perhaps from the tone of the paper, one may suspect that it is a calculated one. The characterization used by Hamza is worth quoting: “as if Muslims have to rub themselves with the Christian ointment in order to be baptized into the Science and Religion dialogue”. His thorough criticism of modernity and his views of the futility and doom of modern science and its belongs to the “apocalyptic” tradition of mystics like René Guenon S.H.Nasr and others, is not what most modern Muslims would be in tune with. Furthermore the scandals overshadowing the later part of Schuon’s life doesn’t speak well of his philosophy and the integrity of his views. He has the habit of using in his essay lengthy quotations from authors without explaining the connection with the specific point he wish to make, making them standalone pieces that one may interpret at wish. The Nobel prize winner S.Glashow, that towering figure of physics and one of the main author of the Standard Model of particle physics has voiced his implacable criticism of superstrings as early as 1986. And how could one not stand impressed by the incredible feat of modern physics in successfully explaining basically the whole of the material world at the various scale lengths using so few concepts? To show how injudicious it is to pick up an oral statement and then building upon it conclusions, let us mention that the same Turok in a recent public lecture gave a stunningly positive assessment of physics where he literally states his excitement on the bright future of modern physics: “The Astonishing Simplicity of Everything”, N.Turok , Perimeter Institute. This may be seen as closely related to the “critical realist” perspective championed by I. Barbour. Of course, one may argue that it is the scientists who produces it and pits it to bad use and so who are to be blamed; but this is a too easy escape as contemporary science in its Faustian stature makes scientists ever ready for transgressions. I more precisely mean that following the Barbour’s typology of the science -religion relationship, he stands both in the integration and conflict categories (And at time, a zest of independence), which is a performance in itself. Yet, he seems to misunderstand what Steinhardt meant, and draws from it questionable conclusions. Furthermore, Steinhardt has much changed in the past decade his stand on the inflation theory that he co-invented in the early eighties, to mostly deny any mathematical coherency to it, even when it may seem to fit the data. There is much to be said about the falsificationist criteria, but that’s not the issue here, and all agree- even its critics- that methodologically if not pedagogically speaking, it is a valuable tool. It faces the fundamental problem from the modern point of view that it has not provided a single palpable, reproducible, useful result. Is it a research program in the sense of Lakatos or is it supposed to be all what there is in a contemplative mode?